Sweet, crunchy, nutty, and candy-like, this delicious recipe can be used for many things: snacking, ice cream or salad toppings, mixed with fruit, sprinkled over cereal, you name it. Only four staple ingredients (pecans, maple syrup, sugar, and cinnamon) are needed, plus 30 minutes of your time. The recipe suggests using evaporated cane juice or maple sugar, but I had neither and regular brown sugar was a fine substitute. Turbinado could also be a good choice. The subtle cinnamon flavor is a perfect complement to the nuttiness of the pecans. A little sprinkling of salt might also add some depth to the flavors. Baking time ranges from 20 to 30 minutes, but I would recommend sticking closer to the 20-minute mark (or once the sugar mixture stops bubbling). Thirty minutes gave these a little too much of a "roasted" flavor, but they were still quite tasty. Make again? Yes. There's no need to buy prepackaged candied nuts again! Walnuts would also be a good substitute here. These look great! I love candied nuts - especially Trader Joe's sweet & spicy pecans which are wonderful in salads or just plain. 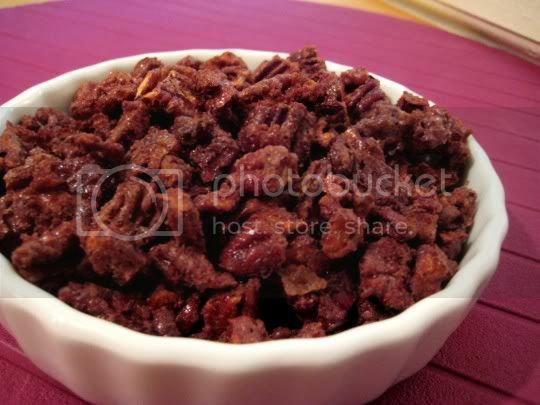 Another guilty pleasure is candied walnuts, the kind found in Chinese restaurants. I'm definitely going to try this recipe (much to the chagrin of my skinny jeans).